Большеформатный фотоальбом группы Metallica с комментариями. "He just gets right the f*** in there.... Every drop of sweat, every molecule of saliva, every out-of-place nose hair, it all gets captured cuz he's just f***ing there" -Lars Ulrich Legendary music photographer Ross Halfin has documented Metallica for nearly 25 years, from their beginnings as a scrappy, furious garage band to their current status as the heaviest and most popular metal band in the world. 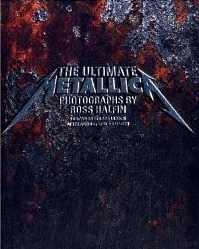 The Ultimate Metallica collects the best of Halfin's amazing images, taken over the years with access granted exclusively to him as the band's main lensman. His candid photographs taken on stage, backstage, on and off tour are supplemented by text from many people close to the band, including managers and music writers, plus some colorful personal observations from Halfin himself.